Until the beginning of the seventies, the work of Alexander Bogomazov remained unknown not only in Western history of art but also in that of Russia and the Ukraine. At the end of 1973, thanks to his Ukrainian colleagues in Kiev, A. Nakov was able to gain access to the studio of this artist which, at the time, was still in the custody of his widow. Impressed by the great pictorial quality of this artist’s Futurist work, he spoke about him on several occasions in Western Europe and in Russia. 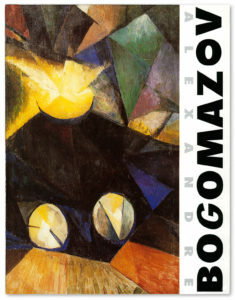 After the fall of the Berlin Wall, an exhibition of this work became a possibility that was realised in 1991 at the Musée d’Art Moderne in Toulouse, whose Director, Alain Mousseigne, not only shared Andrei Nakov’s enthusiasm for Bogomazov but made every possible effort to have this work shown in his museum. This was in fact the artist’s first posthumous exhibition. Encouraged by the success achieved in France, the Ukrainian authorities took up the torch at that point and showed the same exhibition in Kiev. Since that date several publications have appeared in the Ukraine, while this artist’s works have joined Russian and Western collections. The Toulouse exhibition catalogue written by A. Nakov contains inter alia the translation of the artist’s theoretical treatise Painting and its Elements, 1914, whose analytical relevance gives it indisputable importance in the history of modern art. See below for extracts from A. Nakov’s dictionary article on Alexander Bogomazov in the Dictionnaire d’art moderne et contemporain, Éditions Hazan, 1992. The artistic development of this Ukrainian painter provides one of the rare examples of pure Futurist creation outside of the influence of Cubism. So his evolution is surprisingly similar to that of the painter Boccioni. During Bogomazov’s lifetime, the portion of his work between 1908 and 1914 never reached beyond the limits of his birth-place, which explains why he remained unknown outside of Kiev until 1973, when some of his Futurist paintings were included in the ‘Tatlin’s Dream’ exhibition in London. The pictorial path of this highly original painter began with an important series of Symbolist works (portraits, landscapes), whose pictorial style falls within the lineage of Pointillism. His acute sense of colourist expression led him by 1910 to create works that could be described as Fauvist or Expressionist. They can be situated in the line of the Munich Russian school (Kandinsky, Jawlensky), whose first Russian manifestations took place within the framework of the famous ‘Izdebski’ salon in Odessa. Like Kandinsky’s, Bogomazov’s pictorial creation was animated by a deep spiritualisation of the visible. He attributed forms with a dynamic power and a highly subjective symbolic (vitalist) charge, which enabled him rapidly to go beyond the limits of descriptive narration of a realist nature. His urban scenes and mountain landscapes hold the same spiritual charge and a dynamic power that has a great deal in common with the creation of Franz Marc, despite there being no direct link between them. Bogomazov’s work between 1913 and 1915 was purely Futurist: one can clearly see the power of the shattered objects which allow the abstract forms to appear. In 1914, a decisive year for the emancipation of his plastic vision, Bogomazov wrote a theoretical treatise entitled ‘Painting and its Elements’. The lyrical tone and the philosophical orientation of this treatise make it akin to the aesthetic orientations of Kandinsky, as expressed in ‘On the Spiritual in Art’ (1911). It should also be noted that, quite independently of Malewicz, there appeared here for the first time in the pictorial theory of our century the symbolic image of a black square conceived as the ‘totality of the signs of art’. Between 1914 and 1917 the artist stayed on several occasions in the Caucasus, where he occupied the modest post of drawing teacher. This allowed him to survive materially and to take care of his delicate health. He returned to Kiev during the civil war. In 1922 his art and his personal charisma gained him a teaching post at the city’s Art Institute, which had the distinction in the late twenties of including such renowned teachers as Tatlin and Malewicz. In the second half of the twenties, Bogomazov returned to a figurative expression that could be defined as post-Futurist. His best-known work from this period is entitled ‘The Woodcutters’ . This composition, for which there are known preparatory studies made over several years, represents geometrical, somewhat dematerialised bodily figures. In these paintings made at the end of his life the subject’s obvious symbolic weight reaffirms one of the constant features of Bogomazov’s work. This artist’s work during the period 1913-1917 is one of the highest points of the Futurist Symbolist tendency, and as such has no equal in Russia. The only two works that can be compared to Bogomazov’s finest paintings are those of Boccioni and Franz Marc. • Alexandre Bogomazov, cat.exp. Musée d’Art Moderne, Toulouse, 1991.